I'm a bit nervous about how to begin this process. I've wanted to participate in a culture exchange for as long as I've known about Montessori, at least a year. After reading about others swaps and encountering several dead ends, I decided that I will have to lead one. I debated whether to try for an international exchange or a US-based one. In the end, I decided that a US-based one would be better and cheaper for my first one. 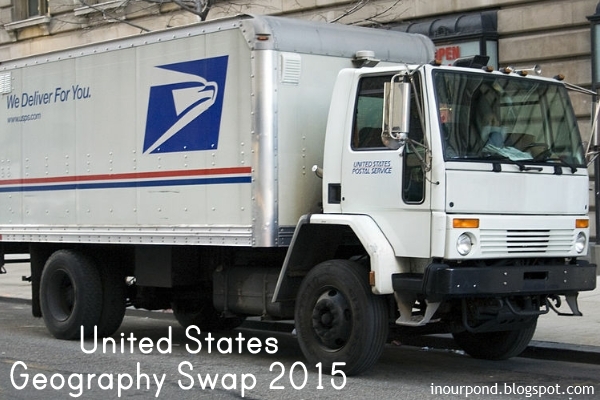 Introducing the United States Geography Swap 2015! - I will be advertising this swap in several places in hopes of making at least 1 team of 5 people/families. If I get more people, I'll make other teams. - After I get everyone assigned to a team, I will share the contact information (e-mails) with the 5 participants of each team. - Each participant will put together one box of items from your state for each of the other participants on your team (and yourself, if you chose). - The items will be shipping in a USPS Priority Mail Medium Flat Rate box (unless team participants decide on another size). - At the time of this blog post, a flat rate medium box costs about $13. Each participant can expect to pay at about $52 (13x4) in shipping the boxes. - I (Missy Pea) am not responsible for the results of this swap. I will organize and host the best that I am able, but there is also a lot that I won't be able to control. - This is a child-friendly swap. Please ensure that your box contents are appropriate for all ages of kids. - Your box can be a mix of homemade, free, and store-bought items. - Because the United States is so diverse, please include a little about yourself or family and your heritage in the box. - Please include at least 2 books about your state in general or a part of your state history. - You may chose to find and prepare printables for your state OR you can include them on a CD-Rom for printing at a later time. - Other ideas for the contents: brochures, recipes, food, toys/trinkets, postcards, nature items (shells, seeds, etc), flags, artifacts, tourist items, objects representing your family, and anything else you can fit in your box. - This swap is open for individuals/families/schools in the United States, our districts, and territories. - You and your team are responsible for how this exchange will go once I've set up the teams. - You must commit to sending 4 boxes. - Communicate with your team through e-mail to exchange addresses. P.O. Boxes or alternative addresses may be used for security purposes. - You and your team must decide your deadline or any additional rules. - Please send an e-mail conformation to everyone on your team after you've shipped your box. If you would like to participate in this swap, please leave a comment on this post, post a message on my blog's facebook page, or reply to my inquiries. Let's do this thing!